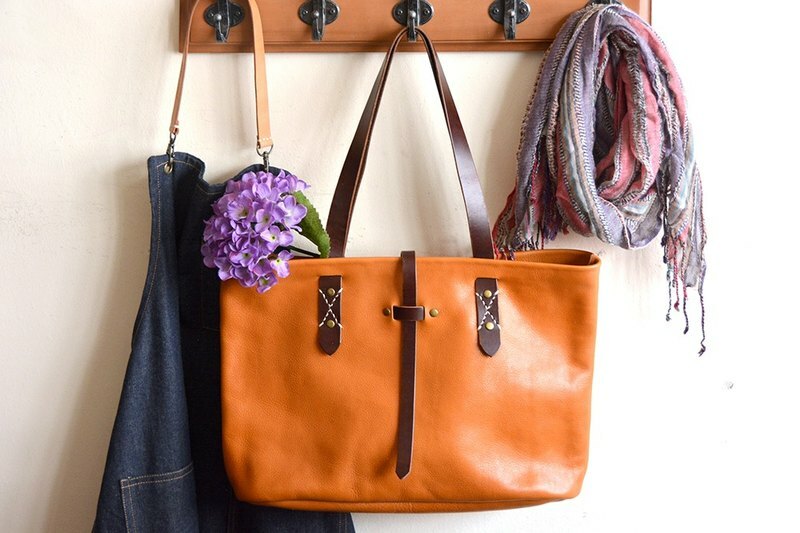 This tote bag is hand-stitched with high-quality vegetable tanned leather. There is an inner zipper pocket. This tote bag is hand-stitched with high-quality vegetable tanned leather. There is an inner zipper pocket. It can be detached. Size: about 28cm height x 44cm width x 12cm depth Inner detachable zipper bag: 16cm height x 24cm width Strap length: about 55cm Color: light brown body with dark brown strap. Step 1: This item is an in-stock product. If you want to order a new one, please contact the designer first. Step 2: Put the item in the shopping cart and fill in the personal information. Step 3: The designer will confirm with you the details within 2 days after receiving the payment. Please reply in 2 days, otherwise it may delay the shipping date. Step 4: In-stock product will be shipped within 3 working days. Step 5: When the item is being shipped, shipping notice and tracking number will be provided.